Like many other nail bloggers, I too have been a terrible nail biter in the past. It started at age five or six and it continued till I was about nineteen. Nail polish has always been a hobby, ever since I got my first bottle of nail polish (silver, holographic bar-shaped glitter!) from my aunts. But I almost never got to enjoy my polishes on my nails because I could never fully get out of the habit of biting them. But then I stumbled upon nail blogging world and rediscovered my love for nail polish, I pampered my nails, started doing nail art and now I'm talking to you guys ;-) Since two years I'm finally able to say that my nail biting days are pretty much over. But then I went to the movies (In Time)... 109 minutes later I got two little nubbins on each hand, what just happened?! Sigh. Guess the movie was even more exciting than I thought, lol. Anyways, that's why I couldn't post anything earlier than planned, my nubs were really too short to share them with the world, haha. And honestly they still are, but oh well, that's why I made some nail art to distract you all. Hah! My base color is H&M Blue My Mind, I love how bright the color is, a true eye-catcher. I'd say it's a darker periwinkle blue creme, the formula seems a bit thick sometimes, but it's still fine and needs the average two coats for full coverage. On top I did some free hand stripes in random sizes with my favorite striper polish China Glaze Ink. 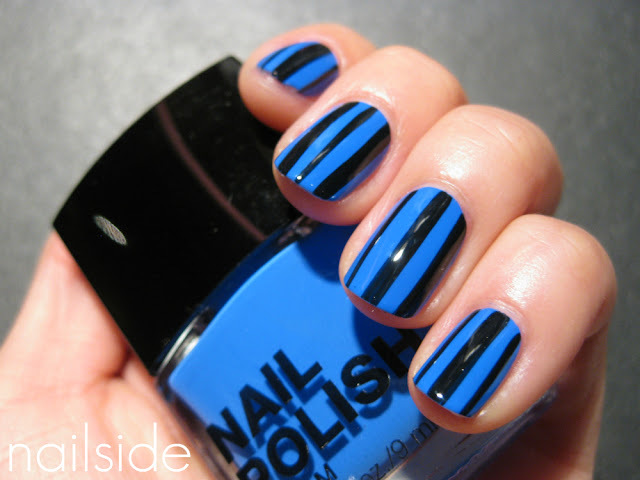 I really like these simple stripes, because they're so easy to achieve plus the vertical pattern can make shorter nails look longer, which I kind of need right now :P Hope you like it too and thanks for reading if you made it this far. Good night! I love it!!! I've got this polish, too. I have to try this. Wow, you freehanded those stripes? I'm so impressed! They look perfect! Love this color combination and the stripes look amazing! I bit my nails for 21 years, too. I actually still want to bite them if they're unpolished. :\ Movies used to be my absolute weakness, so I know exactly how you feel! I love these two colors together!!! Perfect as usual!! How long do you reckon it usually takes you to do a mani btw? 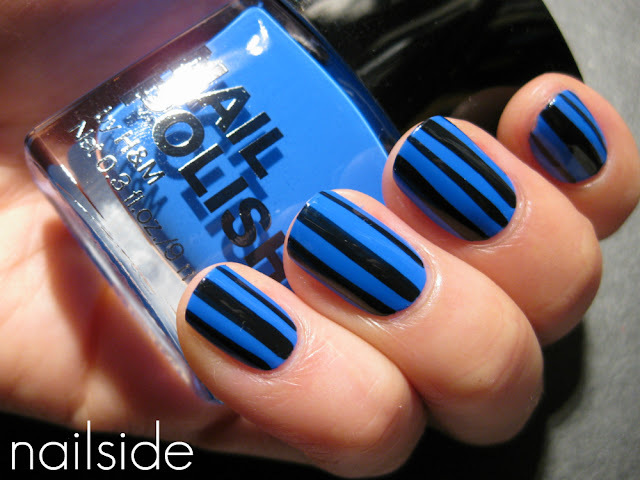 Stop cheating with your amazing freehanded stripes! I'm so jealous of your skills, lady. Um... those stripes are freehand? I need lessons from you - they're absolutely fabulous! this packs a punch haha, your striping is perfect! I love this blue, want. This is a really pretty mani too. Thank you for your comments, dear readers, you guys are the best! I must say I love nubs - nub manis look so chic and edgy! And I love your whole blog :) . The pace of your writing is good, the photos are clear - both visually and as illustrations for tutorials - and the designs themselves are innovative and beautiful without going over the top. I applaud you and subscribe to your blog :D .